On a 1–9 scale, the average rating was a 6.48 (above 5 indicates growth). 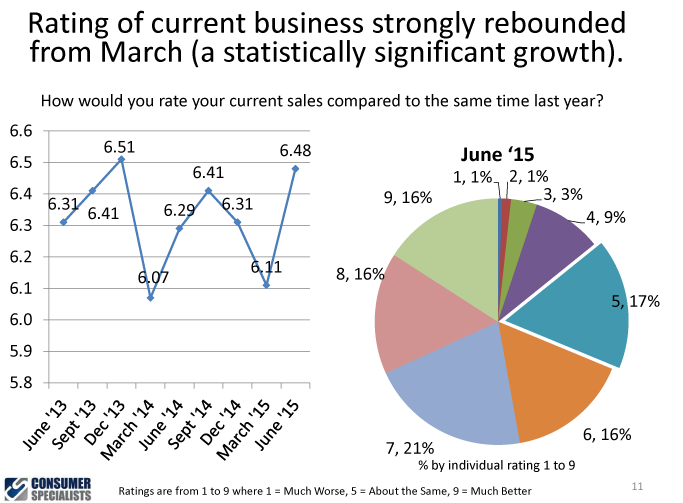 This was a statistically significant upturn versus the 6.11 recorded in March. A meaningful portion of that growth came from remodelers reporting the very highest current business rating of ‘9: Much better than last year.’ About 1 in 6 remodelers gave that top end rating versus less than 1 in 100 that gave the lowest rating of ‘1: Much worse than last year.’ In fact only 14% of remodelers reported any level of decline while 69% reported growth. Looking at the subcomponents of the current conditions shows all with gains versus the prior quarter. One of the changes was statistically significant, ‘Value of jobs sold.’ This measure hit an all-time high in the June study, a sign that bigger dollar projects are becoming more common. Altogether, this data points to a strong environment for remodeling projects. Looking at the expectations for business three months from now, a large majority (68%) see some level of growth, while only 8% are anticipating any declines. The average rating of 6.29 was only slightly behind last year’s 6.32. Growth drivers continue to be led by ‘postponed projects’ which was mentioned by 76% of remodelers, a small uptick from the prior quarter. The full Remodeling Business Pulse survey is available here.